Happy weekend! Sorry I’ve been MIA a couple days. I’ve finally entered back into the real world. Back to work, vacation’s over. I got a job with the Air Force, in the marketing department! Awesome, because it means I can walk to work in 5 minutes. Though I won’t lie, I drove yesterday. But it was overcast and I can’t risk being pelted by hail or sucked up in a tornado! Anyhow, at the beginning of the week, before I started work, Nick and I, along with one of his friends, brewed a new batch of beer! (Did I mention I overshopped at the comma store?). This was our fourth beer. We previously made a pumpkin ale, a ginger peach amber, and a Belgian ale (a star in my Three Bean Chili and Nick’s Belgian Ale Pot Roast). This time, I wanted something light and summery, so we decided to brew a Belgian Wit! Wheat beers are definitely my favorite, and this recipe for cookies includes orange peel and coriander, just like Blue Moon. This recipe comes from my friend (and former Paris roommate) Aimee, who is an awesome brewmaster and has won many awards for her beer! 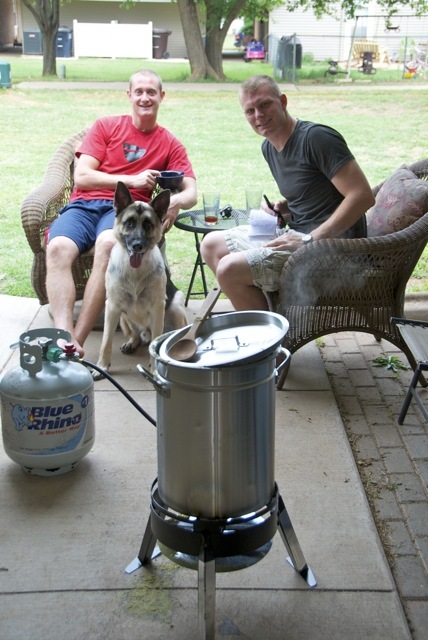 What does all this beer brewing have to do with cooking? 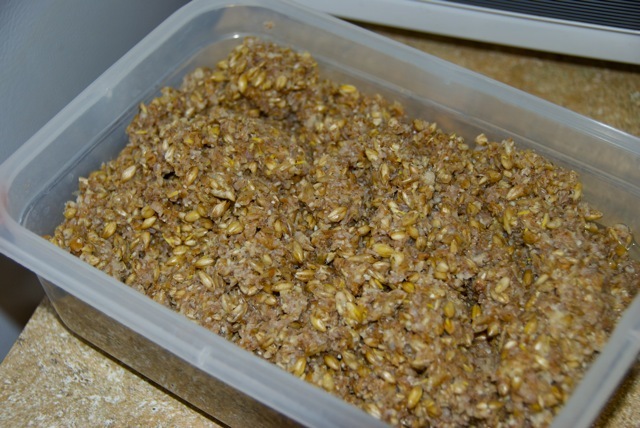 Well… Aimee also shared with me a recipe for making dog treats out of the used grains from brewing. This beer included wheat, oats and barley… all dog friendly ingredients. And we had A LOT. In fact, this tub was about 2/3 full. 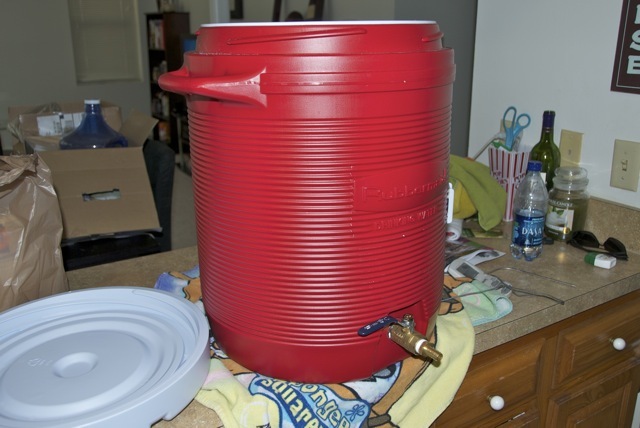 It was something like 11 lbs of grains when they were dry, so you can just imagine how much it was after soaking in water. If you brew, and have a dog, you definitely need to make these. Great way to keep the grains from going to waste, and SO much cheaper than biscuits at Petco! Preheat oven to 350 degrees. 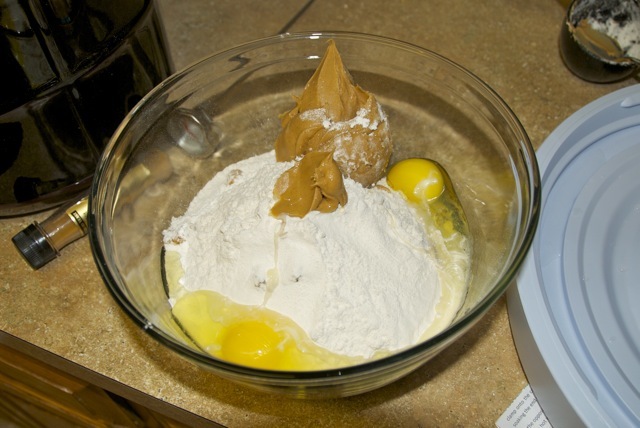 Mix all ingredients thoroughly. I used my hands; it sure was messy! Spread in an even layer on a sprayed baking sheet. Score it into the shapes you want. I just did squares. The dough is really wet, so you can’t really use cute cookie cutters like some of my other recipes. Bake for 30 minutes to solidify it. Remove from oven and lower the temp to 225 degrees. 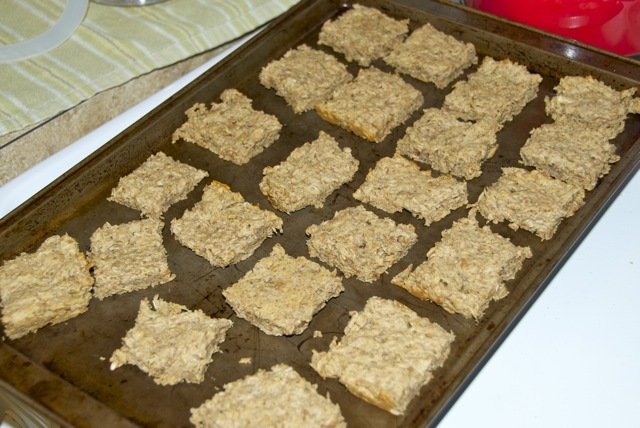 Break the treats apart, and spread out loosely on 2 baking sheets. Return them to the oven and bake at 225 degrees for 3 hours. Cool and store in an airtight container. Kaiser loves these! Though he loves pretty much anything with peanut butter. I have to admit though, I tried one, and it was pretty tasty… even without sugar. 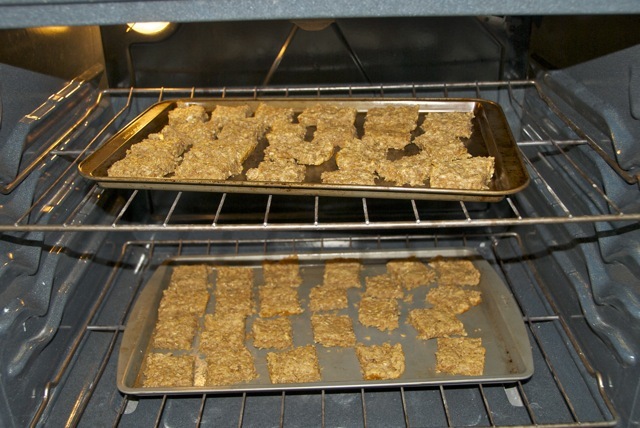 I researched and found out that you can add some honey, nuts and raisins and make granola bars! I had good intentions, but now I think by the time I get around to them, the grains will have been sitting in my fridge too long. Kaiser might get another batch of treats, though! Woof! awesome!! thanks for the plug, i’m so glad you used my recipes! 🙂 let me know how the beer turns out! I am so glad I stumbled upon this! I was recently offered a ton of spent barley by some home brewers for just this purpose and I’ve been searching everywhere to make sure it was safe for the pups! Thanks so much!! Are you doing anything to the spent grains after they come out of the mashtun? I’ve seen where some folks are drying them in the oven and grinding but I assume you are just using drained grain. 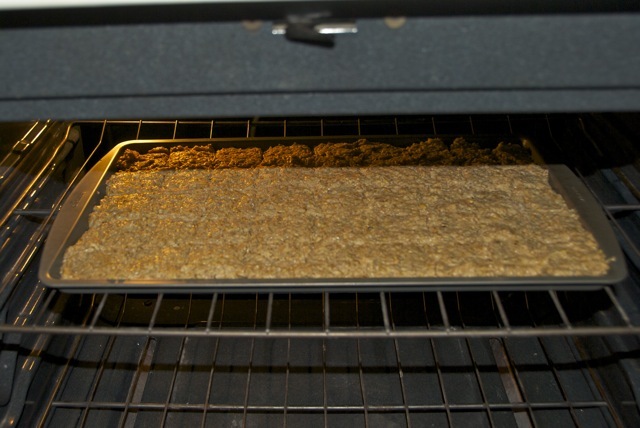 Just using the drained grain for the dog treats… but I’ve been wanting to try drying & grinding it to make pizza crust with it! Oooh! The pineapple hefe sounds awesome! Hubby is just finishing up a coconut porter, I’m curious to see how it comes out!